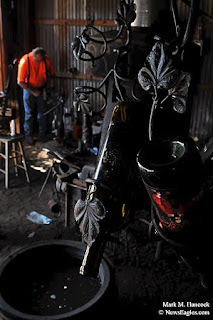 Blacksmith Lonnie Robinson of Wagon Wheel Forge & Gallery removes a glowing-hot railroad spike from the fire during the 23rd annual GrapeFest in Grapevine on Sunday, Sept. 20, 2009. 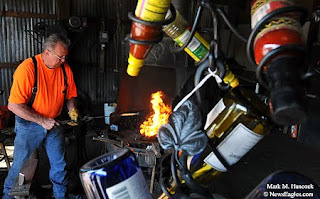 Custom wine racks hold bottles as blacksmith Lonnie Robinson of Wagon Wheel Forge & Gallery works on another piece during the 23rd annual GrapeFest in Grapevine. 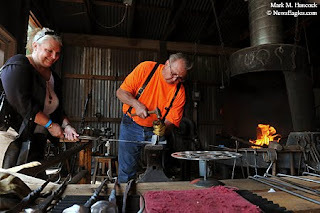 Customer Lynn M. Farestad (left) holds the end of a steak turner as blacksmith Lonnie Robinson (right) hammers a monogram into the railroad spike at Wagon Wheel Forge & Gallery during the 23rd annual GrapeFest in Grapevine. 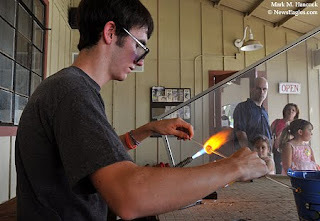 Flameworking artist Corbin Fonville, 16, makes glass marbles during the 23rd annual GrapeFest in Grapevine on Sunday, Sept. 20, 2009. 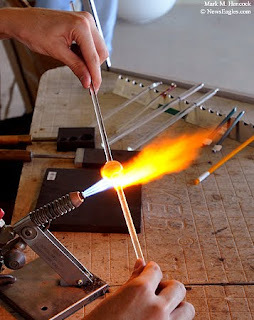 Hot glass glows as flameworking artist Corbin Fonville, 16, makes colorful marbles during the 23rd annual GrapeFest in Grapevine. 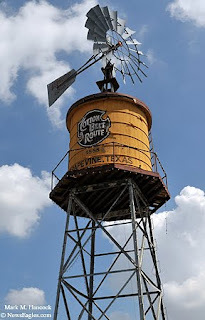 A windmill-powered water tower welcomes visitors during the 23rd annual GrapeFest in Grapevine on Sunday, Sept. 20, 2009. Historic Grapevine is Tarrant County's oldest settlement. 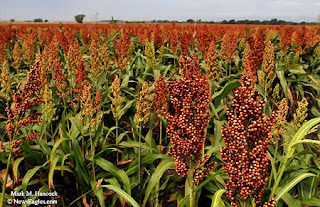 It was founded in 1844, a year before Texas joined the United States. 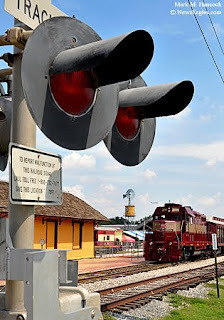 A 1953 GP-7 diesel locomotive pulls passengers in authentic 1920s and 1930s Victorian-style coaches as they ride The Grapevine Vintage Railroad along part of the historic Cotton Belt Route between Grapevine and the Fort Worth Stockyards. Rather than post a visual opus slideshow of the annual GrapeFest, I'll add vignettes. Please see the additional sections as they post during the next few days. 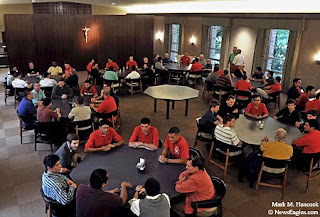 Serrans and seminarians visit during a Serran dinner at Holy Trinity Seminary in Irving on Saturday, Sept. 12, 2009. The annual golf scramble was rained out. 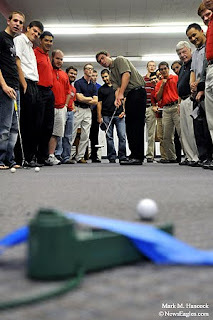 However, the Serra club provided dinner, a raffle and golf-related competition in the seminary game room. Fr. 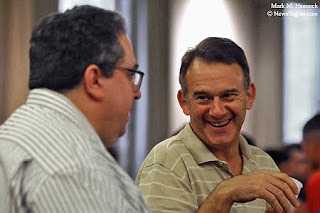 Michael F. Olson (left) talks with Serran Richard Stanzel of Dallas during a Serran dinner at Holy Trinity Seminary. Seminarians ladle barbecue sauce onto brisket during a Serran dinner at Holy Trinity Seminary. Fr. Michael F. Olson (left) laughs while seminarian Giuseppe Spoto (right) claims the top prize during a Serran dinner at Holy Trinity Seminary. 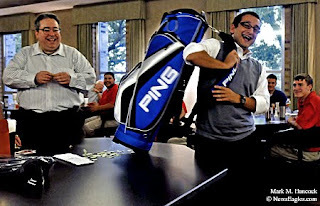 Spoto, who is not an avid golfer, gifted the bag to another seminarian before dinner was completed. Serrans and seminarians watch as the putt of Paul Bechter's ball approaches the cup after a Serran dinner. Serrans and seminarians react as the putt of Paul Bechter's ball misses the cup after a Serran dinner at Holy Trinity Seminary in Irving. The annual golf scramble was rained out. 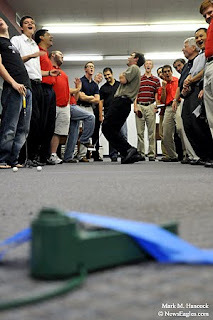 However, the Serra club provided dinner, a raffle and golf-related competition in the seminary game room. Tactical flight officer Sr. Cpl. Charles Sherek (window) watches for obstacles as pilot Sr. Cpl. 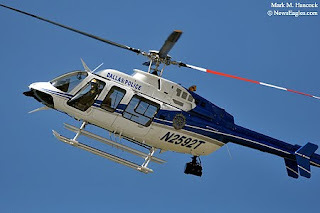 J. Rucker performs a fly-by during the Dallas Police Department helicopter unit's 40th anniversary celebration at the Frontiers of Flight Museum at Dallas Love Field in Dallas on Aug. 8, 2009. 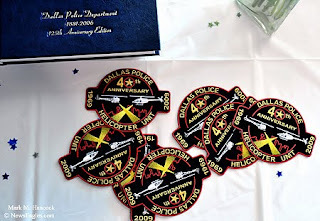 Commemorative patches greet guests during the Dallas Police Department helicopter unit's 40th anniversary celebration at the Frontiers of Flight Museum at Dallas Love Field. 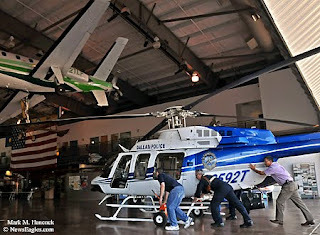 Organizers push a Dallas Police Department helicopter into the Frontiers of Flight Museum during the DPD helicopter unit's 40th anniversary celebration. 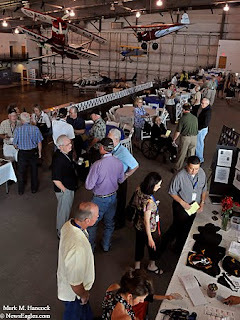 Guests visit during the Dallas Police Department helicopter unit's 40th anniversary celebration at the Frontiers of Flight Museum at Dallas Love Field. Former Police Chief Frank Dyson visits with other officers during the Dallas Police Department helicopter unit's 40th anniversary celebration at the Frontiers of Flight Museum at Dallas Love Field. Dyson founded the helicopter unit while he was chief. Astronaut and Dallas native Jim Reilly (left) talks with Sr. Cpl. 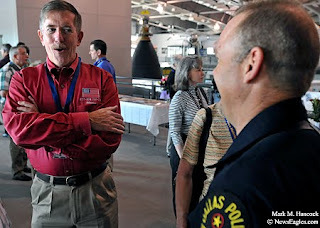 Charles Sherek (right) during the Dallas Police Department helicopter unit's 40th anniversary celebration at the Frontiers of Flight Museum at Dallas Love Field. Thomas Mitchell (left) and W.D. 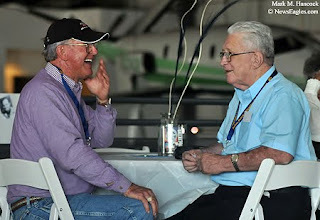 Smith (right) catch up during the Dallas Police Department helicopter unit's 40th anniversary celebration at the Frontiers of Flight Museum at Dallas Love Field in Dallas. 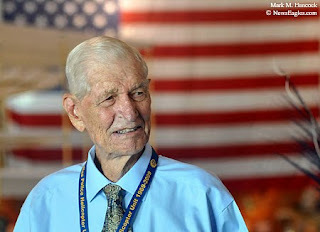 Mitchell was one of the original two civilian instructor pilots while Smith was one of the original four DPD pilots in the program. 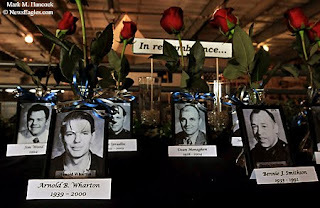 Photos of fallen officers are displayed on an "In Remembrance" table during the Dallas Police Department helicopter unit's 40th anniversary celebration at the Frontiers of Flight Museum at Dallas Love Field in Dallas. 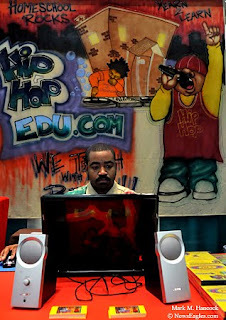 Darren Douglas mans the booth of HipHop-Edu of St. Louis during the 14th Annual Summer Homeschooling Conference at Plano Centre in Plano on Aug. 8, 2009. 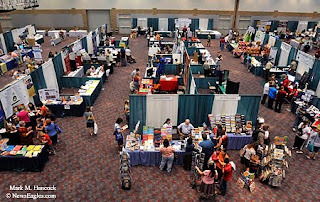 Patrons shop during the 14th Annual Summer Homeschooling Conference. Elijah West, 5, (left) and his sister Sasha West, 3, (right) of North Richland Hills patiently watch their father shop during the 14th Annual Summer Homeschooling Conference at Plano Centre. 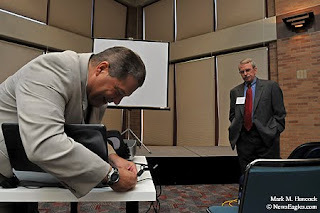 Howard Berg of the New American School in McKinney and the only Guinness World Record-holder for speed reading (left) prepares for a presentation and talks with organizer Stephen Lunsford of the North Texas Home Educators' Network (right) during the 14th Annual Summer Homeschooling Conference in Plano. Susan Kimmons (left) and her son Connor Kimmons, 12, (right) test language software at the booth of My Father's World of Rolla, Mo. during the 14th Annual Summer Homeschooling Conference at Plano Centre in Plano. 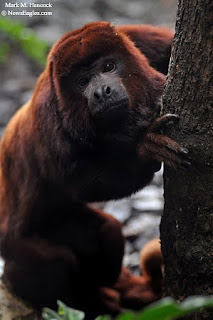 A red howler monkey stretches against a tree at The Dallas World Aquarium in Downtown Dallas' West End on Sunday, Sept. 6, 2009. Fayrouz and I went toured the world without leaving the city at The Dallas World Aquarium. 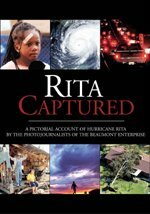 I have a field guide for the animals and will identify most of the animals soon. Please also see Fayrouz's take. Named in this slideshow are: TK. Royal Hardeman of Murphy (right) practices chipping with his daughters Ashley, 19, (left) and Amber, 18, (center) at Pecan Hollow Golf Course in Plano on Thursday, July 30, 2009. Amber, 18; (from left to right) Ashley, 19; Royal and Wanda Hardeman of Murphy celebrate a good putt during a round of golf at Pecan Hollow Golf Course. Ashley, 19; (from left to right) Amber, 18; Royal and Wanda Hardeman of Murphy complete a hole during a round of golf at Pecan Hollow Golf Course. 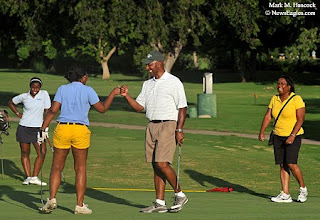 Royal Hardeman of Murphy (center) and his wife Wanda (right) tease their daughter Ashley, 19, (left) during a round of golf at Pecan Hollow Golf Course in Plano. Carol King (left) talks with family as Bob King (right) listens before an auction at the King family farm in Celina on Saturday, Aug. 1, 2009. 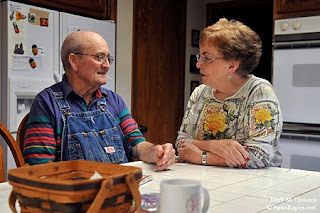 Carol King (right) tries to cheer up Bob King (left) before an auction at the King family farm in Celina. 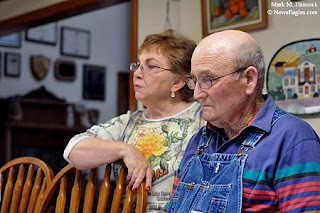 The King family auctioned all their farm equipment now that Bob King's sight has declined. 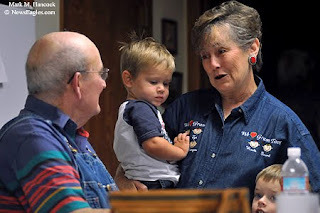 Bob King (left) talks with his niece Mary Wade (right) as her grandsons Grant Creach, 2, (center) and Wade Creach, 5, (lower, right) listen before an auction at the King family farm. 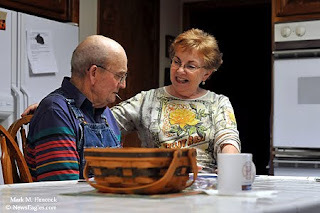 Carol King (right) tries to cheer up Bob King (left) before an auction at the family farm in Celina. 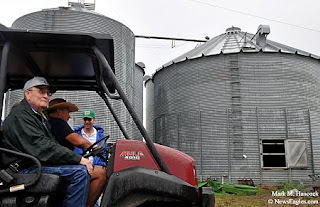 Bob King (left) watches as pieces of his farm are auctioned in the rain at the family farm. 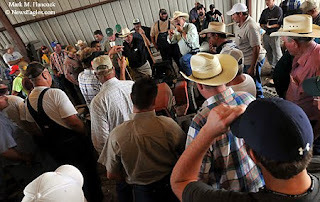 Auctioneer Jim Stafford (top) with Bob Mitchell Auctioneers barks out bids during an auction at the King family farm in Celina. 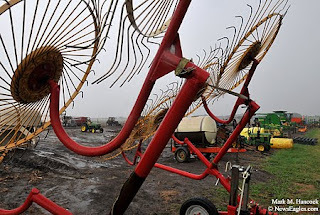 Farm equipment withstands the rain and settles into the mud before an auction at the King family farm. Plants continue to grow during an auction at the King family farm in Celina.